Down on her luck, college-educated art teacher Quinn Sanders is a single mom who's returned to Landers Hollow to raise her five-year-old daughter, Linsey. While working at the local diner, Quinn is befriended by Jason Graves. She has no idea Jason's the youth director of Landers Hollow Community Church until he asks her to lend a hand with the children's Christmas pageant. Jason is dealing with issues of his own--a painful divorce following a doctor's confirmation that he'll never be able to father a child. Jason longs for a family of his own, but, rejected and disheartened, fears it may never come to pass. Jason and Quinn are both searching for a Christmas miracle. 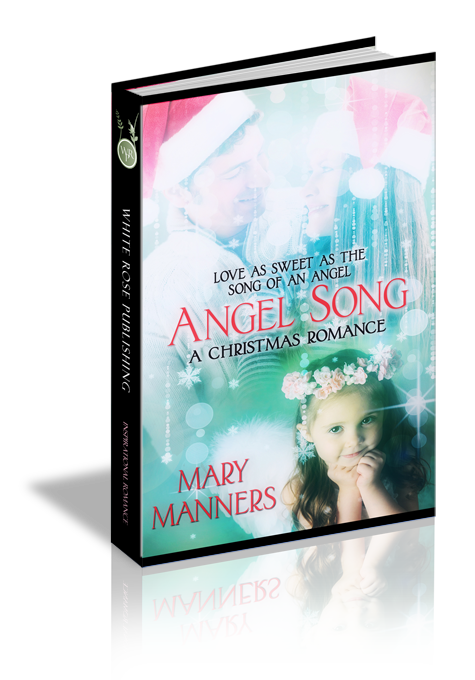 What they find is sweeter than an angel's song. Quinn Sanders juggled a full tray of breakfast platters in one hand and a coffee carafe in the other as she bustled along the crowded booths at Gus’s Diner. Outside, dark clouds lowered over the horizon like a blanket of lamb’s wool. Snow was imminent. Quinn thought of the bald tires on her weather-beaten sedan and cringed. She’d meant to have them replaced with last month’s tips, but then Linsey came down with bronchitis, and the doctor bills had drained just about every cent she’d earned. Maybe she’d win the lottery…if only she had the cash—and the time—to play. No, he wasn’t. The thinning, grizzled hair, complete with comb-over, was proof. Quinn huffed out a breath and gritted her teeth as she turned away. How many more hours ’til she could go home to Linsey? She glanced at the clock on the wall above the cash register as she blew a stray wisp of hair from her eyes…still another two hours—two long hours. Her feet screamed, her lower back wailed, and she felt the kink in her neck creeping up to invade her brain. It was barely noon, and already she’d put in half-a-dozen non-stop hours. The diner’s door flew open, ushering in a frigid gust of wind along with a trio of women carting shopping bags. Black Friday. Ugh and double ugh! Didn’t all these people have anything better to do than rush through crowded stores and throw their money at overworked cashiers? But then Quinn felt the heaviness that filled the pockets of her grease-splattered apron…cash tips—enough to replace the sedan’s tires and pay off the rest of Linsey’s doctor bill, with perhaps a bit left for a special treat for Linsey. She thought of the Christmas list she’d helped her daughter write just last night. There were only a few things Linsey wanted, but even those were more than Quinn could afford on her meager salary and tips from the diner. If only she hadn’t deviated from Mama Cantori’s teachings during college. If only she’d stayed closer to home and been a bit less foolish. Coins jangled in Quinn’s pockets, drawing her back to the crowded diner. Maybe the day wasn’t such a waste after all. A bell in the order window chimed, signaling another round of meals ready for pick-up. She nodded to Gus, the rotund owner and head cook, and held up a finger to let him know she was on her way. He offered his signature wink, coupled with a gap-toothed smile, in reply. She delivered the platters in her hands and filled half-a-dozen coffee mugs as she made her way back to the service counter, thanking God along the way for Gus’s generosity. The kindly man had offered her a job when she needed it most. “Busy day, huh?” Gus spoke in a thick, southern accent distinctive of someone who’d spent his entire life in the Appalachian area. He’d run the diner for nearly a decade, and could have retired as head cook years ago, but he loved keeping his hands busy. So he still manned the grill several times a week. Now, he smiled as he took the order receipt Quinn offered and clipped it along the wall above the serving line. “If you say so.” Quinn nodded and flashed Gus a weary smile before doubling back to fill the cantankerous old gentleman’s mug. “Jason?” Quinn turned toward the windows, where snow had indeed begun to fall in fat, sloppy flakes that blanketed the parking lot. A guy, tucked into the last booth in the corner, motioned with a single finger raised into the air. He offered a slight grin as if apologizing for interrupting her rhythm, and slipped from his jacket, setting it on the seat beside him. She tried not to notice the way his navy polo shirt hugged a terrain of muscles across the wide breadth of his shoulders. He sported disheveled dark hair, just long enough to make him look a bit dangerous, and eyes the color of blue topaz. “What?” He leaned back in the booth, his gaze slipping over her as he waited for her to finish.